To create an emotional impact, brands need to establish a link between the visible brand persona and the call to action through music. Since videos now make up over half of the on-demand music consumption across the globe, the marketing ROI on unified visuals and audio content is more evident than ever. This alliance not only helps to bring forth the wanted emotions but also reaches more people than ever. However, leaving the musical choices as an afterthought won’t cut the chase anymore. The DNA of engaging content consists of credibility, authenticity, relevance, and urgency. Translating these qualities into music is necessary for the visuals to strike an emotional chord. This calls for a design approach for music that truly fits the visual storyline and brand guidelines. If you need further proof, ask Oxford professor Charles Spence and his team. They’ll tell you that the proper unification of sound and visuals enhance the emotional impact of the message by an astounding 1207%! Online streaming has allowed video advertising to evolve from concise TV spots into 5-10 minute short films. While the 6-second ads remain a valid introduction window for brands, storytelling offers a deeper insight to their values. 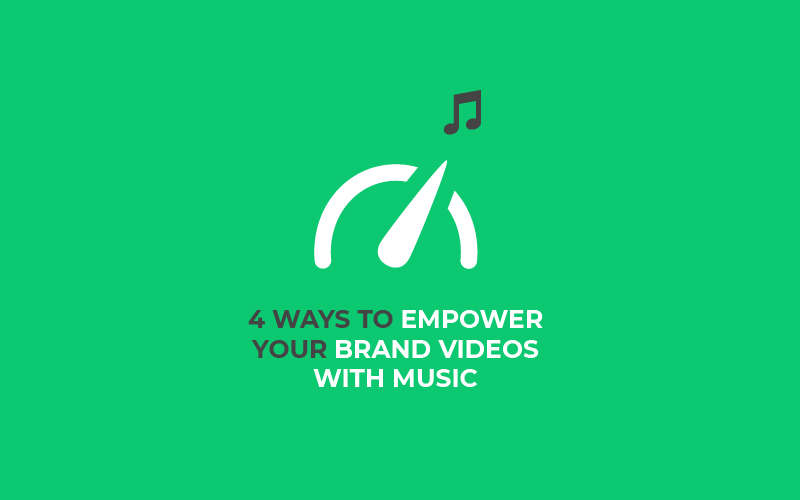 In order to convince, branded videos have to take their viewers on an extended emotional ride with music. Rather than resorting to the repetition of a narrow range of musical content, instead consider spreading your brand sounds over these newly extended 5-10 minute storylines. In addition to short audio clips, expand your outreach with a catalog of brand theme songs linked by a common melody, instrumentation, production style or genre. Developing a larger scope of branded soundscapes helps narrow the gap between rigid ‘corporate’ music and more approachable ‘commercial’ music. Corporate advertising is typically associated with short repetition, whereas artists create demand and following by displaying diverse human emotions in their work. Be more like the artist, and develop a range of emotional musical content to better connect with your target audience. Deriving content from this artistic approach promotes honesty, which is the ultimate soft value a brand can convey. We do offer this caveat, make sure there is consistency across your musical choices! Some branding does still need to be present to tie all of this music together. Much like the ancient Greek King Theseus, who found his way out of the labyrinth, you must find your red thread to connect your brand to these musical themes. In order for your brand to sound original, you must first examine your sounds in relation to your competitors. Get objective by disassembling music into bits and pieces. Ingredients like tempo, melody and acoustic or electronic instrumentation serve the overall melodic dish. By doing so you will be able to compare the assets of your current brand sound with the industry benchmark. Are you literally tooting the same horn or strumming the same acoustic guitar as your competitors? By separating the musical wheat from the chaff you will learn whether your sound truly differs from your competitors. What’s more, it forms you the basis from which to develop your brand sound. Bear in mind that this is not an end in itself. Your brand identity should form the guidelines, from which the theme initially develops. Eventually, the further your content stands apart, the clearer will your brand values shine through. Stirring up memories from the past stands a good chance of tapping into emotions. I myself get instantly nostalgic after hearing the old PlayStation 1 intro. It’s certainly not a musical masterpiece, but it sends me back to my childhood, to unboxing and firing up my console for the very first time. The soundscape helps me relive that exact moment of excitement and pure joy, which are common in human nature. The music we heard as children are the emotional restore points for brands to meet in their content. Think about your target audience. What TV series, cartoons, sports, products or other pop-culture phenomena were they buzzing for in their youth? What role did sounds play in them? More to the point, nostalgia can stretch over generations. For example, generation Z can enjoy the 8-bit Nintendo game music as much as the 80’s kids. Creating a sense of urgency with music alone is challenging. Urgent tunes can mean, among many other things, fast tempos, arpeggios, and subdivided notations. What’s more, blasting music continuously at full speed only helps the content to fall flat in the long run. Therefore, the musical event horizon should be synchronized with other sensory calls-to-action. A sudden tempo or volume change, the introduction of new instruments, vocals, and voice-overs, or any departure from the main tonal narrative does the trick with a timely visual cue. To drive conversion in modern, multisensory brand experiences, leaving music as an afterthought simply isn’t enough. If music is left as a mere accessory, the brand message becomes inconsistent between what we see, hear and feel. What’s worse, it renders the audible content inconsequential and a wasted potential branding channel. It would be like printing your company business cards without a logo. The essential content and information are present, but it could be much stronger, more coherent and professional appearing if the branding is included. A brand’s music content should be based on clear guidelines, the same way as text, images and videos already follow visual guidelines. Superimposed, stock music is the “I love you” that lost its meaning. Taking an analytical approach to sound allows your brand to speak from the heart, and turn the impact dial from minor to major.